Modi and Madhuri. Mansi Soni is “Madhuri”. So is THIS Mansi the one? From here (petition of Pradeep Sharma, IAS, to the Supreme Court), we determine that the name of "Madhuri" is Ms Mansi Soni. This is PUBLICLY AVAILABLE. And widely so [e.g. here or here]. Since 2011. From here (Linkedin) we determine that there is one Mansi Soni, architect, with qualifications from BMS College of Engineering, Bangalore and Co Founder at Ecolibrium Energy (P) Ltd.
From here, we determine that Ms. Mansi Soni has a Facebook account: https://www.facebook.com/mansi.soni.355. Mansi Soni has a youtube channel. From the data compiled above, it does SEEM that this Mansi Soni is the person of interest, although there may well be ANOTHER Mansi Soni who is an architect from Bangalore and who has travelled to Gujarat. I would hope that the actual "Madhuri" speaks up urgently – since her security has been violated by Modi and his gang of thugs. If this profile is the incorrect Mansi, I request to be excused for any unintended attention this post might attract – and would appreciate an email at sabhlok@gmail.com so I can quickly correct this post. This article contains a picture of Mansi Soni, as well. 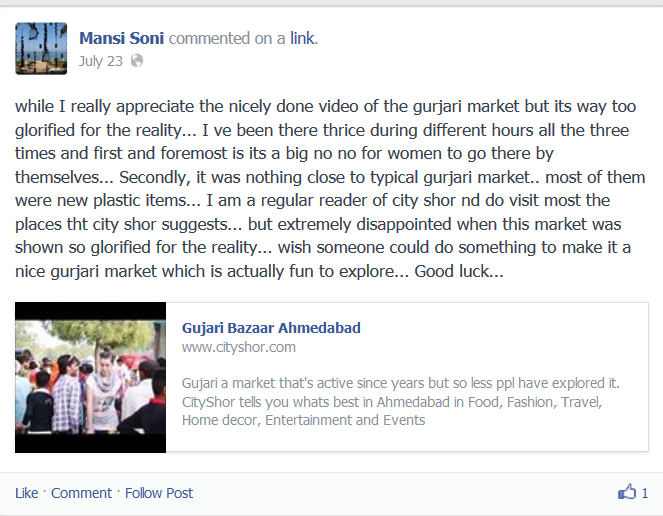 I don't think it matches well with the previous one on the Mansi Soni public profile, though. Further, Gulail has posted this picture (see this for details). I thank you for sharing this article. I am a graduate from BMS College of Engineering (Architecture) Bangalore. I have been vehemently reading on the so called links of Modi with ‘Madhuri’ and that’s what led me to you writing. Mansi Soni absolutely joins the dot. I have know her personally in the past. We joined the Architecture department in BMS College of Engineering, Bangalore in 1994. Her older brother Chintan too graduated from the same College. I personally think she should come out and speak about it. I can confirm the picture of her (blurred image) with Narendra Modi, the individual pic in sepia is not her, neither the pic of Narendra Modi holding a woman’s hand is not her. I can also confirm the facebook account that you have sent a message too as hers. This photo was (and continues to be) on the youtube account named Mansi Soni (https://www.youtube.com/user/mansihsoni1). Fine. But the FB account definitely was the correct account. 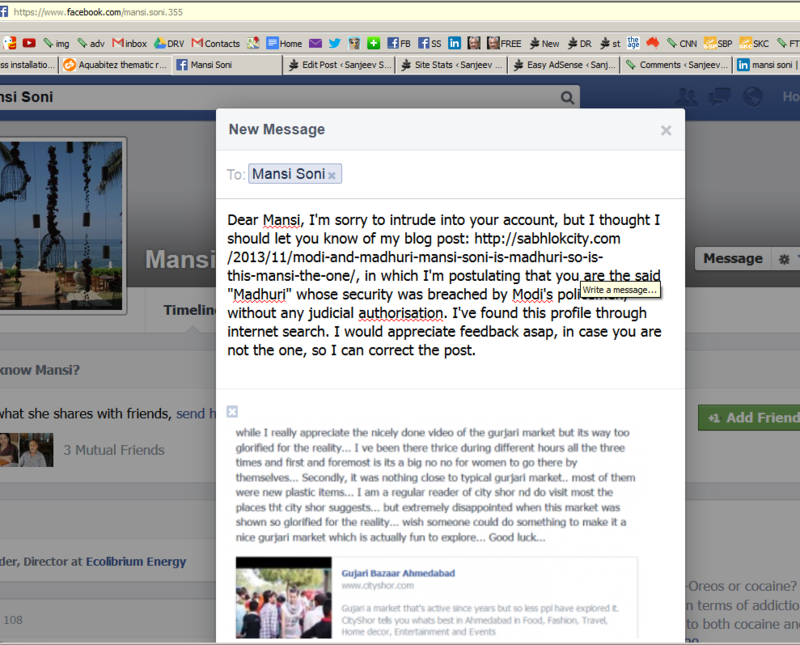 2) I'll try to get in touch with Gulail to tell them that the photos they have of "Mansi" are NOT of Mansi. What if you are wrong? Should not you have first checked with her about her ID before posting all this “exposure” and asking for her forgiveness if she was not the one? I think this is something ANYONE can do with two minutes search on the internet. The probability of another such person with (a) the same name (b) same last name, (c) same educational background – Bangalore, (d) same profession – architecture, and (e) frequent visitor of Ahmedabad is remote enough to be infinitisemal. These are multiplicative probabilities, and can be shown (through multiplying each of them) to be less than perhaps one in thousands of trillions. Unless there is a unique and special coincidence, the identity is not the issue. In my view the public interest is served through clarity regarding both the precise nature of the relationship (recall there are some strong allegations from a senior IAS officer made to the Supreme Court) and what action she has taken upon finding out that taxpayer money was used to invade her privacy/security through extra-judicial surveillance. She definitely needs support in both these things. I would like to know the truth about both the issues, since the are important matters of public interest. And I think I’d be happy to support her in her fight against extra-judicial surveillance by Modi. Modi has invaded her privacy by deploying policemen to shadow her. And thereafter Modi has imprisoned a senior IAS officer who raised questions about Modi’s actions, and who himself was put under extra-judicial surveillance by Modi. Let me add that if people don’t want their details to be made public, they should not set up their public profiles on linkedin, facebook, etc. There are no additional privacy rights once people have THEMSELVES put up their own information publicly. Anyone interested can find out about the identity of such a person in minutes. I expect a debate about THE SUBSTANTIVE ISSUES in this case so everyone is made clear about the facts, and Modi can explain why he has been sending policemen to spy on women. Without judicial permission. I think the only thing of public interest here is alleged use of tax-payer money for allegedly stalking her. Rest should be none of business esp of libertarians….IMHO. This is not just a matter of taxpayer funds (alleged “security” for Mansi) but a matter of due process and how a PUBLIC machinery has been hijacked for private purposes. Due process, spying on private citizens, etc. a) An officer has been imprisoned with allegedly false charges because of this alleged relationship. This is no private matter if a PUBLIC officer can be imprisoned this way by Modi. b) Modi claims to be a paragon of “virtue”. But he is a married man. The public is entitled to know his standard of personal integrity and decide whether they want such a man as their PM. Good work Sanjeev Sir, This was required so as to people know the truth, i checked both the profiles, she has deleted both of the accounts. Now i think she should come out and speak the truth. The profiles have been deleted now, which may confirm its her. Even in her company’s profile (http://www.ecolibriumenergy.com/?page_id=57) her name has been removed from Founders, if you take look at it was Founded and promoted by Chintan Soni and Harit Soni who are brothers, where Mansi Soni is the Director. From this link (http://www.geni.com/people/Pranlal-Soni/6000000007437932321), we can confirm that she is the same Mansi Soni, daughter of Pranlal Soni and sister of Chintan and Harit Soni, and it’s indeed the profile of the same girl, the Pervert Saheb was stalking on. ecolibriume’s twitter account. https://twitter.com/ecolibriume they seem to have removed it from their website. Amit Shah will become the future Home Minister, under Modi’s Govt at the center…Imagine with that kind of power this RSS pervert terrorist will be spying and stalking on more women across the country…Hamare Bahu betiyan ko Bahchao…Saheb is coming to power soon!